A suspected impersonator, who has been using the office of the wife of the president to defraud people. being paraded at the Department of the State Security headquarters in Abuja on Monday. 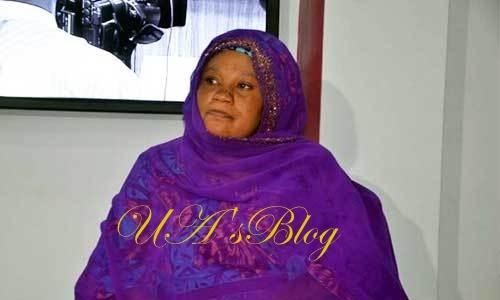 The Department of State Services said it had apprehended a suspect, Amina Mohammed, who also goes by the aliases, Justina Oluoha and Amina Villa, for allegedly parading herself as Rashida Bello, wife of Kogi governor. Mr Peter Afunanya, Public Relations Officer of DSS, disclosed this while addressing newsmen on Monday in Abuja. “She took advantage of the fact that personalities such as First Ladies, ministers and certain categories of officials are not taken through the rigorous protocol and security checks at the villa posts,” he said. The spokesman said that the suspect on November 22, 2017, when she paraded herself as the Kogi First Lady, invited Dr Alexander Okafor, aka Chicason into the villa. “Investigation revealed that the first lady was away on lesser Hajj and not in the villa during the period,” he said. The spokesman said that Okafor had complained that he was duped of over N150 million in respect of a Court of Appeal property Lagos which the suspect promised to help him with. “Investigation has shown that this unholy enterprise is not known by the first lady. What the suspect did was to use the first lady’s name and office as bait to lure and defraud her victims,” he said. She said that Okafor had been buying property from the committee in charge of government property.